This morning at about 5:30, while on my way to Biddeford Pool I had an unexpected detour. 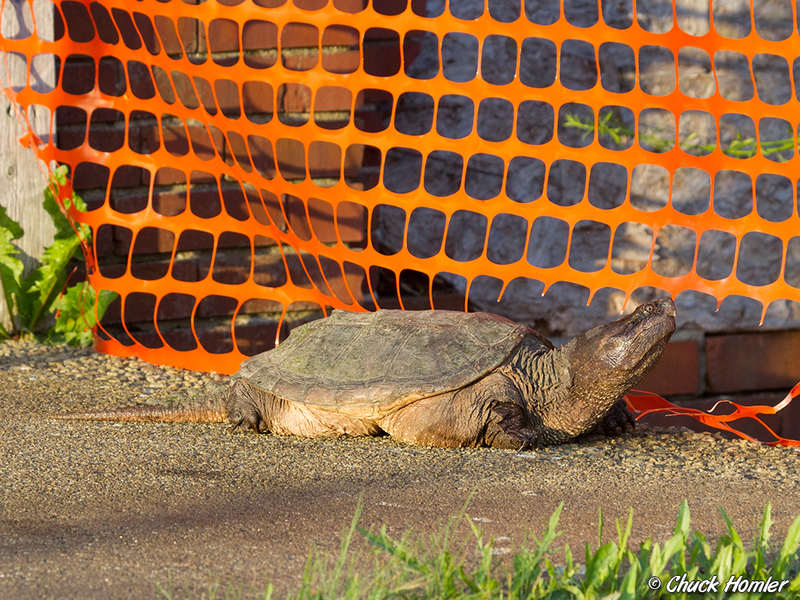 In the middle of Main St, at the top of York Hill near the entrance to the Amtrak station was a very large, very slow moving Snapping Turtle. The thing was about 15″ – 18″ long (just the carapace) and was directly in the middle of the road headed towards the mills. If you ever encounter a turtle crossing the road, the best thing you can do is pick it up and place it on the side of the road that it is heading too. I had no idea what this thing could weigh and, well, its a snapping turtle, so you can understand my hesitation in attempting to pick it up. I stood behind it, making sure that any cars would see it and not hit him and waited about 3 minutes before he finally climbed the curb. He didn’t like that I was there and sometimes would just stop if I stood to close to him. I’d back away and then he’d start to move again. Eventually he climbed up a small sidewalk and rested in the sun near Mill #4.